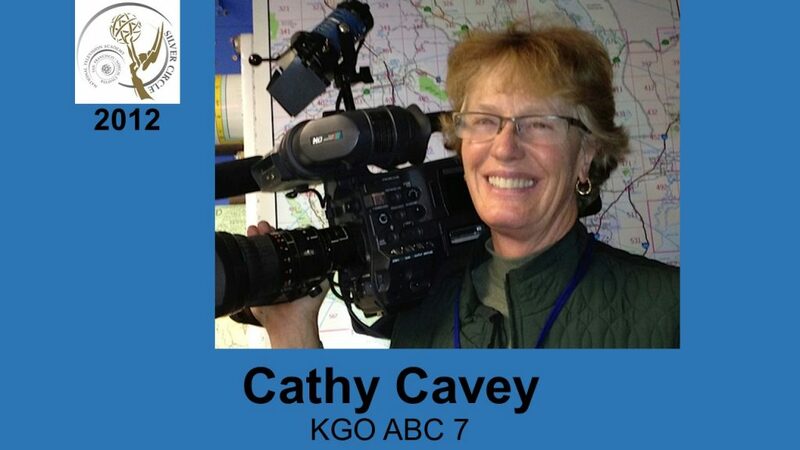 Cathy Cavey has been a news photographer and editor for 33 years, starting at KCRA in Sacramento in 1979 where she covered the refugee crisis in Somalia, the first landing of the Space Shuttle, and the MGM Grand fire in Las Vegas. In 1982 she moved to KGO’s Sacramento Bureau in 1982 and to the station’s San Francisco studios in 1985. Since then Cavey has shot and edited all types of stories: general assignment, features, special projects, politics, entertainment, sports, weather, and medical. Locally, some of KGO’s longest-lasting coverage has been of Camp Sunburst for children with AIDS, and Camp Okizu for children with cancer and their families. Cavey has traveled the world to cover breaking news such as: the death of Princess Diana, earthquakes in Costa Rica and Taiwan, school shootings at Columbine and Virginia Tech; the visit of the Pope to Cuba; profiles of patients in Italy who received donated organs; a special about the origins of El Niño in Peru and Mexico; an Oakland veterans group rebuilding facilities destroyed by the war in Vietnam; Central Valley migrant farm workers in their village in Michoacán, Mexico; and Bay Area tech businesses in China and Hong Kong. Cavey has received five Emmy® Awards; the San Francisco Bay Area Press Photographers Association photographer of the year award in 1996 and numerous SFBAPPA awards for individual stories.